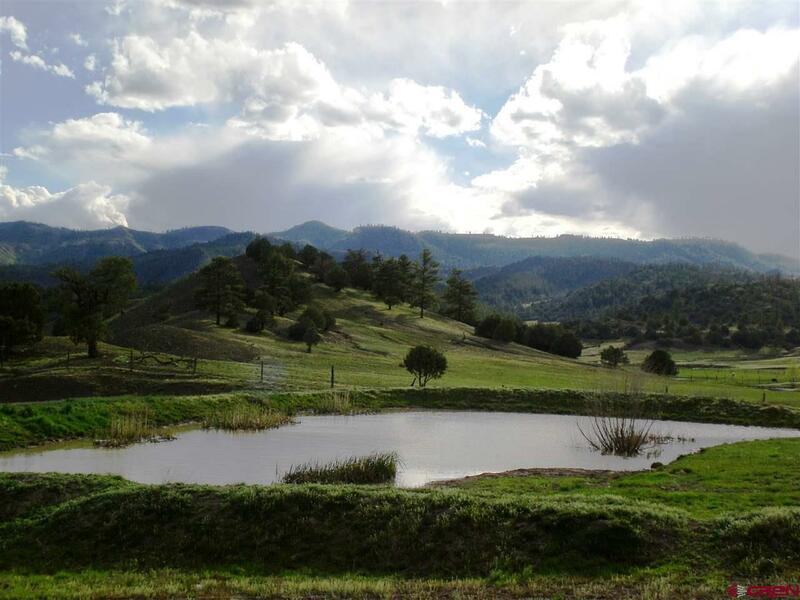 Dutton Creek Ranch is a picturesque 2469+/- acre ranch located just minutes from the town of Pagosa Springs. 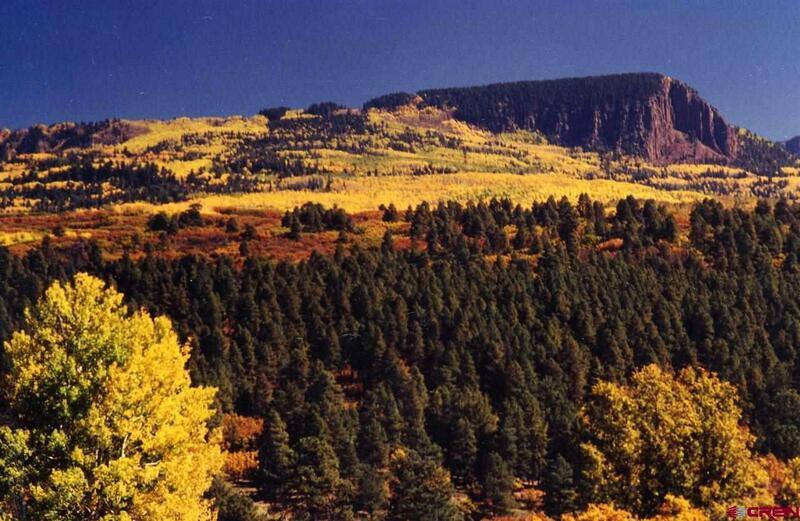 The north side of the ranch borders the 1.8 million acre San Juan National Forest. The south side of the ranch borders and is totally protected by a +/- 160 acre Stevens lake that is designated and owned as a water supplier for the community of Pagosa Lakes. This pristine water feature is fed by mountain runoff from the San Juan Mountains and accents the incredible views while providing an incredible privacy buffer for the ranch on the south side. The ranch includes all Stevens Lake frontage with exception of the dam and one small private ownership parcel, no public access. The lake boundary is a metes and bounds description which corresponds with the elevation of the normal pool as measured by the elevation of the primary spillway. The lake was originally 80 acres, but was enlarged a few years ago to 160-acres courtesy of a successful bond issue, which raised $11 million for construction. A ranch road has been built which connects the ranch to Piedra and Cloman roads, both county and paved. This ranch road could be dedicated as a public road at the time the property is ready to be developed. Public water now serves the existing two houses on the property and public sewer is nearby. Both water and sewer are provided by Pagosa Area Water Sanitation District. The ranch includes a 4000 sq. ft. 4 Bedroom/3.5 Bath ranch house and a +/- 1400 sq. ft. 2 Bedroom/2 Bath log home, both well maintained. The abundant game population is supported by hundreds of transient deer and elk coming off the 500,000 acre Weminuche Wilderness and 1.8 million acre San Juan National Forest migration corridor with unlimited over the counter bull elk tags and 4-5 annual mule deer landowner tags. Black bear and loads of Merriam's turkeys abound. No conservation easements exist on this pristine property and all minerals owned will convey. The ranch has 12.5 cfs of water for irrigation. The ranch can produce upwards of 150-300 tons of high protein hay annually and or carries +/- 200 pair of cattle seasonally as well. Calves historically gain +/- 2.5 pounds per day on this quality protein timothy grass. Pagosa Springs, located 35 miles from New Mexico, is a charming mountain town selected by Outside Magazine in 2015 as one of the best small towns in America. The criteria for this award included â€œthe top spots in the country to work, run, eat, sail, paddle, drink, ride, and climbâ€. Pagosa Springs is known as having the â€œlargest and hottest natural mineral outflow in the worldâ€ and is celebrated for its healing and restorative qualities. The hospital, Pagosa Springs Medical Center, is located within 4 miles of the ranch and serves Archuletta County as well as parts of two adjoining counties and provides immediate critical services to patients, Level IV Trauma care and other emergency services. The Ranch has an average elevation of +/- 7800 feet and is less than a quarter mile from the jet capable Stevenâ€™s Field Airport which is owned by the county. The airport is a full service FBO with an 8,100 x 100 foot runway. Jet fuel, AV gas and parking is available. Commercial air service is available at the Durango airport with direct flights to Dallas/Ft Worth, Denver and Phoenix. This is an ideal property with good investment potential for several reasons: the property necessary for two county road entrances has already been acquired, public water now serves the existing two houses and sewer is nearby, the deeded ranch water has the capacity to build additional lakes, the jet capable airport is a quarter mile from the ranch and is a full service FBO, and the ranch is minutes from town. Dutton Creek Ranch has complete private accessibility for buyers needing direct air access to their piece of heaven in the Colorado mountains. This is a true opportunity to create your own legacy. Call today for a qualified showing. Co Brokers welcome.